Best Quilting Sewing Machine Reviews | Long Arm Machines & More! How To Choose a Quilting Machine That's Best for You! There are many fine sewing machines in the marketplace today, and this guide will introduce you to ten of them. If you are looking for a sewing machine that's good for quilting, there are certain things that you should be looking out for. The sewing machine that you choose should have the capability of creating FMQ (free motion quilting) stitches and be a heavy duty machine. A wider table is preferred both for quilt making and a quantity of other large projects. It should have a good drop feed, and it should facilitate the stitching of free-form patterns. The ability to do decorative stitches is always appreciated. The most important feature that a good quilting machine should have is the capacity to handle thick layers of fabric. Brother HC1850 Computerized Sewing and Quilting Machine: best consumer rated budget machine for quilting. 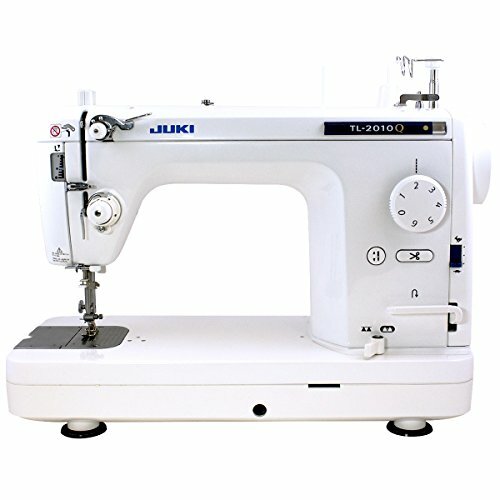 Juki TL-2010Q Sewing Machine: best professional level sewing quilting machine. Juki TL-2000Qi Sewing and Quilting Machine: best long arm professional sewing machine for quilting. *The warranty shown in the chart is for complete coverage: parts, labor and accessories. Most manufactures have longer warranties for the electronic components and chassis. The ratings above reflect how well I feel these machines do for quilting work. This is not necessarily how I feel they are as overall sewing machines. You may also notice some machines have a high review rating, but are lower in the list. That is because of cost benefit. They are great machines, but I am not sure if they are worth the added cost. A quilting sewing machine should have a long arm which is used for sewing together quilt batting, backing, and a quilt top into a finished quilt in significantly less time than more traditional machine-quilting or hand quilting. A longarm sewing machine features a work table, sewing machine head, a few fabric rollers, plus a metal frame. A quilting sewing machine should also have a large frame, medium or large size bobbins, specific quilting feet, ample lighting, auto thread cutting, and a minimum work space of 9". Many of today's quilting sewing machines offer free-motion quilting instead of a long arm. Quilters should make sure that their batting and backing are at least 2 inches larger than their quilt top on every side, and use basting spray before starting to FMQ (Free Motion Quilt). Beginning quilters should look at the lower price range for machines - either under $200 or in the $200 to $600 range. They will need a machine that will backstitch, do multiple stitches, and have ample lighting. Other features that are important for a beginning quilter are a start/stop button, a needle down position, and a wider throat ( that's the space in between the machine and the needle) in order to be able to hold the bigger quilts. A beginner machine should provide high quality, uniform stitches, simple electronic buttons instead of levers and dials, and access to a wide variety of decorative as well as useful stitches. Expert quilters need a variety of options from their quilting sewing machines. First and foremost, their machine needs to have both a long arm and long throat to accommodate advanced quilting. They must have a machine that is both wider and deeper. Expert quilters need to have many customization options, including numerous font and embroidery options, and a great number of stitching combinations. They need the ability to be able to change stitches in midstream, a strong thread tension that can stitch through at least 4 layers of material, and a free arm so that they can use their own patterns. Expert quilters also need adjustable stitching width so they can create unique designs, a top loading bobbin, a clear base (if possible) plus a fully automatic needle. They will appreciate having a full horizontal rotary hook, computer access to a wide variety of patterns and fonts, touchscreens, good lighting, quality FMQ, a broad range of accessories, and a good layered fabric-feeding system. Experienced quilters need a variety of options from their quilting sewing machine, including fast stitching (as much as 1600 stitches a minute), the ability to sew through multiple layers of fabric, and a sturdy, high-quality machine that is constructed primarily of metal and not plastic. They will require a large workspace (at least 9" x 5"). Advanced quilters need a wide variety of options to choose from. They appreciate detailed instruction manuals, tutorial DVDs and videos, and access to online web pages that will provide thousands of patterns, designs, and ideas. They would love to a have a long free arm (1' long would be ideal), a layered-fabric feeding system, an automatic plate converter, simple LCD touchscreens, and extra-bright LED lights. Finally, advanced quilters will need an adjustable knee lifter, accessories such as a ditch quilting foot, a quilt binder set, and a quilt piecing system, which helps advanced quilters to move many layers of thick batting and fabric through their needle while at the same time controlling the stitches from every angle to achieve a 1/4" seam. Prices for beginner sewing machine quilters range from $100 to $500. Advanced or expert quilters should look at sewing machines in the price range of $600 to about $1200. There are plenty of machines out there that are more expensive, but this review is focusing on the best lower to medium range machines for beginners, intermediate quilters, and advanced quilters. As always in life, you will get more features and a higher quality product from the more expensive machines. But, as is also the case in life, you will be able to fine quality advanced features on less expensive machines as well. It is important to both read reviews and do some research before deciding on a particular machine. Why You Should Buy It: This machine contains the greatest number of quilting options of all machines reviewed here. The Brother HC1850 Computerized Quilting and Sewing Machine is an exceptional machine with an almost limitless number of special features. This machine has 8 different styles of auto-size one-step buttonholes, a detachable foot controller, eight specialty feet for blind hems, overcasting, buttonholes, quilting, zippers, and more. It comes with a stitch flip-chart attached, and features very easy, dependable threading of bobbin and top thread for high-quality, consistent stitching. This top quality machine is adaptable for everything from creative quilts, basic monogramming, sewing buttonholes, adding beautiful decorative stitches to craft projects and clothing, and more. The HC1850 has 55 alphanumeric stitches perfect for basic monogramming and 8 unique styles of one-step buttonholes. It is a quilter's dream come true. Quilters enjoy the detachable wide table, the capacity for free-motion quilting, and the spring-action quilting foot. This machine has been designed for ease of use and flexibility and includes 8 presser feet, an automatic threading system, adjustable sewing speed, and a detachable foot controller. Other features of this lightweight and portable machine include a bright backlit LCD-display screen, and an extra bright work area, just right for when you're sewing darker fabrics. The sewing speed is adjustable as you work, and the automatic needle threader works with just one touch of a lever. The bobbin is quick-set, and winds easily. Simply move your bobbin right, push Start, and the bobbin winds quickly. Your creativity can flourish on quilting projects, thanks to a drop-feed system for free motion quilting. This machine comes with an accessory pouch with a three piece needle set, three bobbins, a twin needle, ballpoint needle, eyelet punch, cleaning brush, screwdriver, extra spool pin, seam ripper, and three spool caps. Why You Should Buy It: This machine is highly recommended for free motion quilting of any type. The Juki TL-2010Q has very few computerized parts, has a reputation for being easy to maintain, and can last a lifetime. It can stitch through 5 layers of batting and fabric easily, and you can quilt leaving your quilting-pins in place without interfering with the smoothness or length of your stitches. This machine is portable, but not extremely lightweight (weighs 40 pounds), so it won't vibrate, but can still be easily carried to class or moved to a kitchen table. The Juki functions like a much more expensive commercial quilting machine. It sews a 1/4" seam straight at high speed and is all you need if you're not looking for fancy embroidery stitches. This machine stitches effortlessly through several fabric layers with nice, even stitches. It winds bobbins evenly and smoothly. The bright LED lighting is perfect, it has a responsive foot control, and it provides very smooth fast sewing. This machine has a good knee lifter and presser foot pressure control, a side loading bobbin, and gives the sewer the ability to use either cones or large spools of thread. It sews extremely well, even on thicker projects, and it's easy to adjust. Sewers should be sure to oil this machine frequently, as per the manufacturer's instructions. Take care of this machine, and it can last a lifetime - it's sturdy, quiet, dependable, and quick. Why You Should Buy It: This machine is lightweight, versatile, inexpensive, easy to master, and dependable. 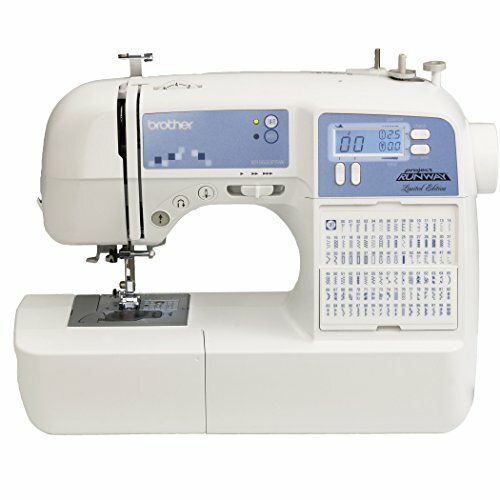 The Brother XR9500PRW Project Runway Sewing Machine is very reasonably priced. With 100 unique stitches, this machine is perfect for creating totally unique quilt designs. It has a larger sized backlit LCD screen offering computerized stitch selections, plus a flip-stitch guide. There are 55 built-in alpha-numeric stitches for basic monogramming or lettering, eight styles of auto-size one-step buttonholes, and a wide oversized table that comfortably accommodates all larger quilt projects. Additional features of this top quality machine are 140 separate stitch functions, a free arm for sleeve and cuff sewing, a simple bobbin-winding system, a well-lit LED work-area, a needle position button, simple-to-use needle-threading system, and a jam-resistant drop in top bobbin. Accessory feet included are a zigzag foot, buttonhole foot, button sewing foot, zipper foot, blindstitch foot, monogramming foot, and an overcasting foot. An accessory pouch is included with ball-point needle, needle set, three bobbins, twin needle, screwdriver, extra spool pin, cleaning brush, seam ripper, power cord, spool pin, and operation manual. This machine is a godsend for both beginners and more experienced sewers. The speed adjustment switch keeps newer sewers from sewing too fast. It is quiet and easy both to set up and to operate. The quilting table extension is handy, as is being able to see the bobbin through a clear window. The needle can be set automatically to end up either in the down or up position automatically by default. Although there are just a few controls, everyone is useful and simple to use. The motion is compact and very lightweight and is easy to travel with. Its monogramming feature is simple to use. Overall the Brother XR9500PRW is quiet, simple to operate, and has a great bit of functionality. Why You Should Buy It: This machine is easy to use, has a large selection of quality stitches, and provides easy free motion. The Laura Ashley CX155LA Computerized Sewing and Quilting Machine is an affordable, high-quality machine. It features a simple-to-view LCD back-lit screen display, one touch stitch selection, variable speed control, and a quick-set jam resistant drop in top bobbin. A super-bright work area is perfect for sewing dark fabrics, and the easy-needle threading system operates with just one touch of a lever. This machine allows you to become your own home interior designer. You can make beautiful curtains, add decorative stitches to blankets and pillows, and get creative when quilting with 135 stitches to choose from. There are 10 unique buttonhole stitches, zigzag and overcast stitches that help to keep your fabric from fraying, and a blind hem stitch that will create almost invisible hems on throw blankets and curtains. The Laura Ashley CX155LA has a lever on the back to allow you to drop feed dogs completely and has a large extension table, both requisite for free motion embroidery and quilting. It also has auto pilot sewing (when you use a button instead of using a foot pedal) and variable speed control. This machine produces beautiful work using the circular sewing attachment. This machine has "idiot-proof" bobbin threading and is powerful enough to sew multiple fabric layers. It has many useful attachments and comes with an English and a Spanish manual, plus an instructional DVD. The lighting is excellent, the automatic needle threader is much appreciated, and it is sturdy yet lightweight. It is a workhorse of a sewing machine and would be the perfect starter machine for anyone. The Laura Ashley Sewing Machine sews extremely straight, has simple-to-learn computerized functions, has great instructions, and is very simple to use. It makes quilting a lot easier too. Why You Should Buy It: This is a quiet, reliable machine which doesn't do fancy stitches but is perfect for quilting. The Juki TL-2000Qi Quilting and Sewing Machine is a full rotary-hook machine which must have the bobbin tension, and top-thread tension set exactly to sew properly. It also has six oil ports which must be properly filled. If this is done, the Juki functions as a premier machine, both externally and internally. This machine is constructed of all metal parts - no plastic here. That being said, it is a powerful workhorse of a sewing machine. It has fantastic visibility and a tapered head, which makes free motion quilting a snap. There are no problems with eyelashing or tensioning, there are no tangles in the thread holder, and it has a fantastic auto thread cutter. This machine is quiet, leaves the smallest tail, and sews perfectly each and every time. The thread can be cut with your foot, and the knee lifter allows you to lift and cut without taking your hands away from the machine. The pressure foot doesn't have to be lifted by hand, nor do you need to push its cut button manually. This reasonably priced machine provides the ideal quarter inch seam and is perfect for the quilter. It is quiet, doesn't vibrate even when operating at high speed, and has an excellent foot control. As long as you remember to oil everything before you start and read the instructions, you'll be all set. It is also excellent for quilting a king quilt in quarters. 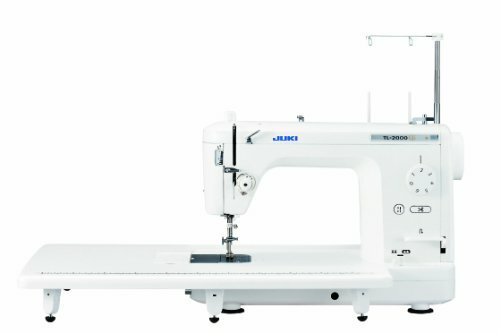 The Juki TL-2000Qi is a high-quality, heavy-duty machine that sews through multiple fabric layers easily. No more irregular or missed stitches, broken needles and overheating from sewing bulky fabric! The thread cutter saves a lot of time, and there are no tension issues to speak of. Free motion quilting is accomplished well, even at high speed. Why You Should Buy It: This machine has clearly explained instructions and set-ups and works like a charm. The Brother cs6000i 60-Stitch Computerized Sewing Machine is a value-packed, versatile machine for quilting and sewing projects. It has a variable speed control which adjusts sewing speed easily and a stop-start button which permits use without the included foot control. Accessories are held inside an arm compartment and include an overcasting foot, buttonhole foot, zipper foot, monogramming foot, zigzag foot, button fitting foot, blind stitch foot, spring-action quilting foot, and a walking foot. Other accessories included are a twin needle, accessory pouch including needle set, three bobbins, spool pin, seam ripper, cleaning brush, eyelet punch, screwdriver, operation manual, power cord, oversized table, and a hard protective case. This machine is portable, user-friendly, economical, and has a large range of quilting and sewing features. It has 60 built-in stitches, seven styles of 1-step buttonholes, and nine included presser feet. The oversized table is detachable, making it easy for you to carry your machine to classes. It also has an automatic needle threader, simple-to-view back-lit LCD display, adjustable sewing-speed control, a quick-start guide, and simple-to-follow threading diagrams. The Brother CS6000i Computerized Sewing Machine has easy bobbin winding, a bright work area, and a built-in free arm that makes sewing sleeves and cuffs a breeze. Both new as well as experienced quilters love the large assortment of quilting features this machine provides. The walking foot permits multiple layers to feed more smoothly, the quilting foot allows quilting stitches to be more accurately placed, and its oversized table lends itself to an easier maneuverability of those larger quilting projects. It even has a special quilting guide that will assist you in sewing more evenly spaced rows of stitches. More fancy sewing feet and stitches are included in this machine than you'll ever need. This machine feeds smoothly and never chokes. Why You Should Buy It: This computerized machine has all the accessories, bells, and whistles that any sewer could desire. 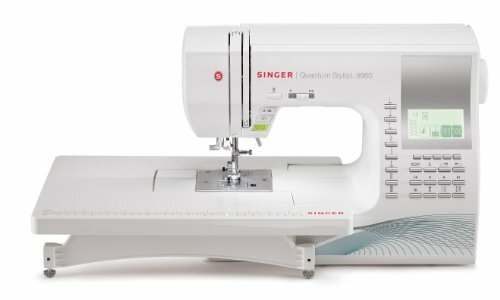 The SINGER 9960 600-Stitch Quantum Stylist Computerized Sewing Machine has a stainless steel bedplate which ensures even sewing with a smooth fabric feed, and a heavy-duty metal frame that guarantees quiet skip-free sewing. In addition, it features a top-drop-in bobbin system, an automatic needle threader, as well as an automatic 1-touch thread cutter that trims lower and upper threads when you're done sewing. This machine has a unique buttonhole underplate, quick threading, automatic stitch width and length, direct-button stitch selection, and a stop/start button. It also has a programmable up/down needle, twin needle electronic control, a slower sewing speed option, automatic tension, drop feed, free arm, super-high presser foot lifter, and warning animation. It has a large number of included accessories - an adjustable bias binder-foot, which allows you to create beautiful edges with your choice of bias tape, and a braiding foot plus guide that stitches and guides braids, cords, and trims for decorative embellishments. 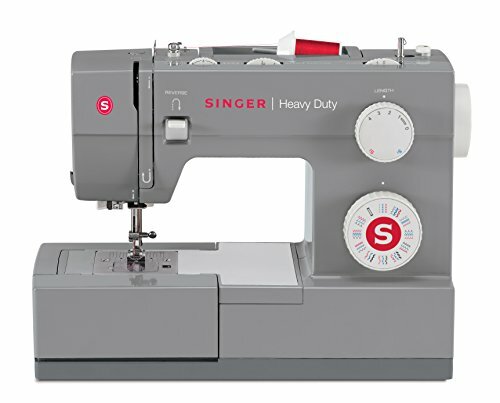 The Singer 9960 Quantum Stylist machine provides a single-welt cording foot, which adds a professional finish to home decor and upholstered projects, a stitch-in-the-ditch foot perfect for creating perfect edges and seams on quilts, a clear piping foot, a fancy-trim foot, clearance plate, and an all-purpose foot. If this isn't enough, this incredible machine also comes with a zipper foot, satin stitch foot, button sewing foot, a combined buttonhole foot plus underplate, an open toe foot, overcasting foot, blind hem foot, cording foot, narrow hem foot, embroidery and darning foot, 1/4" foot and an even feed foot. Bobbins, a pack of needles, brush, seam ripper, auxiliary spool cap, screwdrivers, spool pin felt, seam guide, quilting bar, and thread spool caps are also included. This machine makes free motion quilting much easier because of the ability to adjust the machine speed and drop feed dogs. Why You Should Buy It: This machine is best for a beginner sewer or embroiderer who is familiar with the Internet and uses social media. 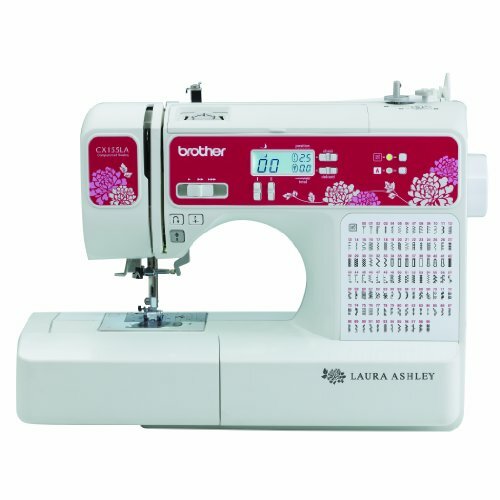 The Brother SE400 4x4 Embroidery and Combination Computerized Sewing Machine can quilt, sew, embroider, and more. It features a touch-screen back-lit easy-to-view LCD display, five lettering fonts, 70 built in embroidery designs, 120 frame-pattern combinations, and 67 different sewing stitches, plus 98 stitch functions. Its automatic one-touch thread cutter cuts bottom and top threads with ease. In addition to a bilingual user manual and a 25-year limited warranty, it provides free lifetime phone support. This machine is user-friendly, has a great variety of features, and is easy to adjust and thread. That being said, this machine is much more of an embroidery machine (for designs smaller than 4" x 4"), and not so much a quilting machine. It has a complete assortment of accessories - an embroidery hoop (4" x 4"), soft cover, embroidery arm, a number of accessory feet, including overcasting foot, buttonhole foot, zipper foot, monogramming foot, button fitting foot, blind stitch foot, and an embroidery foot. 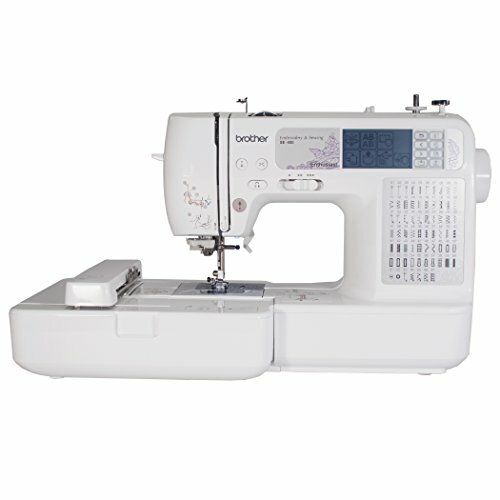 The Brother SE400 Computerized Sewing/Embroidery Machine also comes with a Spanish/English operation manual, embroidery bobbin thread, power cord, USB cable, and an accessory bag complete with cleaning brush, seam ripper, 2 screwdrivers, needle set, 3 spool caps, 2 touch pens, 3 bobbins, and scissors. It's relatively easy to switch between sewing and embroidery on this machine - just change out the base and the foot. When switching between stitches, the LCD screen will inform you of which foot should be used. Features that online reviewers particularly like are the automatic needle threader, automatic thread cutting and reinforcing stitches, the start and stop button, the needle up and down option, the speed control, and the screwdriver included to loosen or tighten the presser-foot ankle. Why You Should Buy It: This machine is recommended for people who want a simple button controlled, computer free, rock solid machine. The SINGER Sewing 4432 Heavy Duty Extra-High Speed Sewing Machine can handle sewing a tripled-over flatbed-seam which was composed of twelve layers of stretch denim! Users call it a workhorse and say that it's powerful, very fast, and provides consistent stitching. Beginner sewers like the machine, and praise the Singer website that contains a number of tutorials and videos. They have used this machine to make trench coats, suits, tool carriers, tents, camper curtains - in short, items that require a heavy duty machine. This machine was used to make heavy canvas and duck vests, knife sheaths, backpacks, and even holsters! This portable machine has been used to sew fleece blankets, hem pants, and sew denim and burlap feed bags. Users like the self-threading feature, the metal plate, the ability to remove the arm when you want to sew hems, its smoothness, and quietness. This economical machine has been used for putting in zippers in a very heavy winter jacket, making costumes of all kinds, and for sewing on leather. The Singer 4432 has an outer veneer of plastic but is primarily made of metal. It threads easily, has a good number of decorative stitches, and can sew through several layers of denim as well as deer skin without a glitch. It has been recommended by very active quilters. If you need a machine that can do a straight or zigzag line and a few other stitches, then this is the machine for you. This machine makes perfect buttonholes, has easy bobbin winding and threading, a good needle threader, and impressive speed. It handles a king sized quilt easily, and can even work on knits and denim. A reviewer mentioned using it to recover a couch made of heavy material, and noted that zipper installation was very easy. Why You Should Buy It: This heavy duty machine is a great value and works flawlessly with minimal adjustment needed. The Brother PQ1500SL has a rating of 4.6 out of 5 stars. It has a beautiful wide working area for quilting, and it does a great job of free motion quilting - it is plenty speedy, the wide throat space is ample, and the stitches are even. The weight of the machine is substantial and does not shift while sewing. This machine does need a little adjustment after taking it out of its box - presser foot pressure had to be adjusted, and the feed dogs dropped. The bobbin case location on the machine's side instead of in the front or on the top is handy. Users commented that this machine is ideal for quilting and that they are glad it doesn't include all those unnecessary computerized embroidery stitches. Users find the free motion foot incredibly easy to use, the stitch consistency great, and the machine very capable of sewing through multi-layers of material and thick vinyl. They use it to make clothes, purses, sweaters, and bags, in addition to quilts. In conclusion, after reading hundreds of reviews and articles discussing the 10 quality machines reviewed above, it is this editor's recommendation that the Brother HC1850 Computerized Sewing and Quilting Machine is the best combination sewing machine and quilting machine in the low to intermediate price range on the market today. It has everything that a quilter could desire - a wide detachable table, 14 separate quilting stitch functions, a spring-action quilting foot, and the capacity to do fine free motion quilting. This machine is versatile, reliable, and chock full of features. It provides a stunning assortment of 130 stitches, 8 different styles of auto-sized buttonholes, unique and beautiful heirloom sewing, and fantastic stitches for all sorts of clothing. This machine is sturdy, comes with clear instructions and DVD, and in addition, it has a limited warranty of 25 years plus free phone support for the entire life of this product. You would have to search long and hard to find another machine that matches this one for quality, quilting options, and accessories.